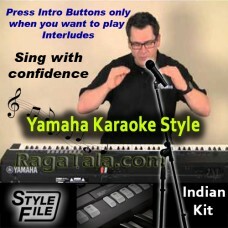 These are the styles (Beats/ Rhythms) for Yamaha keyboards with Intros and Interlude pieces added into Intro I, II, III buttons, so you don't need to learn how to play these music pieces for your performance while singing, just press one of the Intro buttons and a perfect music Intro or Interlude pieces will be played automatically and then it will come back to Main A, B, C or D. All you need you understand is what Bass Note (KHARJ) you are going to sing the song with, so o press the right note or Chord (Major/ Minor) before using Intro buttons. NOTE: This style use the tones and drum kits which are available in the Yamaha keyboard Models PSR S970, S770, S975, S775, A3000 only. This style may not play the right sounds in other Yamaha keyboard models. If you want to buy this style for any other Yamaha keyboard model, please contact us before you buy, tell us the model of your keyboard and we will modify the tones accordingly. Movie/ Album: An Evening In..
Movie/ Album: Akhiyon ke jharokon..
Movie/ Album: Jis desh me..
Movie/ Album: Dil Tera Deew..
Movie/ Album: Student of th..
Movie/ Album: Woh Kaun Th..
Movie/ Album: Mr. X in Bomb..
Movie/ Album: Mere Jeevan S..
Movie/ Album: Jab jab pho..